Pitching your business in front of a national audience sounds daunting, but for James Flawith, Founder of Lil Worker Safety Gear, it’s just the latest step in a journey that’s taken him from Comox to living rooms across Canada. Avid viewers of CBC’s Dragons’ Den will likely be familiar with James and his troupe of adorable “Lil Workers”, as he memorably pitched his business to the Dragons. The Vancouver Island native’s idea seems simple – a robust range of safety apparel designed specifically for children, comparable to adult-sized products – but it’s something that had never been done before, prompting James to step into the breach. In a little over two years, this passion project has become a national sensation that’s captivating parents across Canada. “I wanted to protect my children from careless drivers, speeding vehicles, and from getting lost. I thought to myself – ‘I’m an arborist, not a clothing designer’ – but nobody else is doing this, kids are getting hurt and somebody has to do something,” said James. “That’s why I started Lil Worker Safety Gear, I make real safety gear that keeps kids safe, because growing up is tough work. Coming up with Lil Worker Safety Gear was just the first step. James suddenly found himself needing to learn a whole new industry, skillset, and the complications involved in making clothing – all while working his day job. Like so many entrepreneurs, it required long hours and a lot of dedication. “Look, I didn’t know how I was going to start the company, All I knew was that I was going to figure it out,” James said. “There was a lot of long days and weekends as we built the original four prototypes that would become our first product lines. I set up a Facebook Group and that was awesome for learning the kind of products parents were looking for, and finding out how they’d use them. I learned a lot about myself during this time. When I step into the arena, it’s all on me and there are no scapegoats. 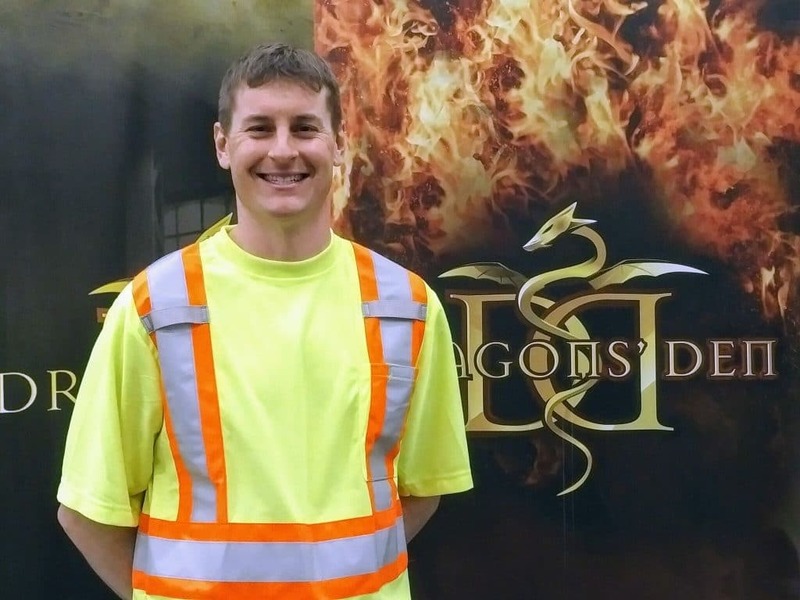 With the business rapidly expanding and buzz spreading across British Columbia, James decided to take Lil Worker Safety Gear national by applying to appear on Dragons’ Den. Following a successful audition in Nanaimo, he trekked to Toronto to stare down the dragons. It’s an experience he’ll never forget. “Pitching to six millionaire investors known for ripping apart entrepreneurs on national television? That was a piece of cake,” he joked. “I stressed pretty hard about that to be honest. I didn’t sleep for two days before we filmed the pitch, and I must have practiced it about 3,000 times – in the airport, on the plane, at the hotel, during dinner – people must have thought there was something wrong with me! The whole time I was at the studio it was like this weird out of body experience. Like a lot of entrepreneurs of my generation, I grew up watching Dragons’ Den. I always loved watching someone walk into the Den with an awesome idea and blow the Dragons away. Or, when someone wouldn’t blow them away and instead get eaten alive. Now that someone was going to be me. “I was prepared for the worst-case scenario. I was comfortable with that before I even auditioned in Nanaimo. I knew from the start I had to be willing to accept whatever happened in the Den, and learn from it. Ever since I started Lil Worker Safety Gear, I have been taking it to people and saying, ‘Tell me I shouldn’t do this; tell me this isn’t very good; tell me I should stop.’ Nobody has said it to me yet, so I just kept taking it higher and higher up the chain until I arrived in the Den. I managed to secure a deal, and it validates to me what I’m doing here. With Dragon Manjit Minhas investing $75,000 for one third of the company, the future looks bright for James Flawith and Lil Worker Safety Gear. The two have been in close contact since filming wrapped in April, with James already leaning on Manjit’s business nous. “Right after the filming I was told I had 15 days to get my numbers to them. I’ve had Skype meetings with Manjit, and we are working this thing together,” he said. “Just because you shake hands and strike a deal on the show, doesn’t mean the deal automatically goes through. A lot of deals fail during the due diligence process and I am doing everything I can to ensure that doesn’t happen to our partnership. Manjit has been amazing to deal with, and her people have been very professional. “I have some pretty big goals but I’m still focused on taking teeny tiny steps to get there. The publicity we get from Dragons’ Den is going to be huge for Lil Worker Safety Gear. It feels like everyone in Canada has been emailing me since the show, and I suspect things are going to get a little crazy! A year ago, James and Lil Worker Safety Gear were nominated for a Small Business BC Award. Though the company narrowly missed out on winning, James believes the experience was a great learning tool. “I was nominated for a Small Business BC Award last year and I had a great time going through the different phases of the awards contest,” James said. Nominate your small business, or a small business you love, for a Small Business BC Award. Nominations run from October 1 until November 30, so Nominate Today!